Introducing one of Dr. Narins favorite filling substances for wrinkles and scars that gives a beautiful, smooth, youthful look: Restylane® in New York City. Restylane® is an FDA approved substance since 2003 and is one of most popular fillers in the US today. Dermatology Surgery and Laser Center was one of 6 centers nationwide that did the original studies for FDA approval. 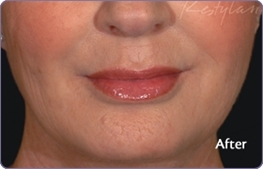 The lips and earlobes are also wonderful areas for Restylane® enhancement. At our practice in New York City, Restylane® in combination with BOTOX® Cosmetic or Dysport is the gold standard for non-surgical lunchtime facial rejuvenation. Restylane® is a stabilized non-animal hyaluronic acid gel. It is clear, transparent, viscous and is supplied in a syringe with a tiny 30-gauge needle. 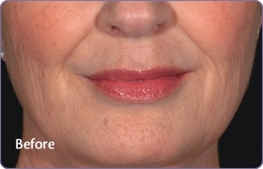 Restylane® degrades slowly so it lasts for 6-12 months. Patients usually see results 2-4 days post treatment. Restylane® is non-allergenic so skin testing is not necessary and it can be used immediately. Because it is a non-animal product there is no risk of transmitting disease or eliciting an allergic reaction in patient's sensitive to beef, chicken, or eggs. Additionally, it can safely be used on people allergic to collagen. Dr. Rhoda Narins or her staff would be happy to discuss this wonderful filler with you. Women and men from Westchester County, New York City, and other parts of New York City visit Dr. Narins for wrinkle treatments, liposuction, laser skin treatments and other injectables such as Botox®, Juvederm, and Radiesse. Call (212) 288-9910 (Manhattan) or (914) 684-1000 (White Plains) to schedule an appointment and learn more.